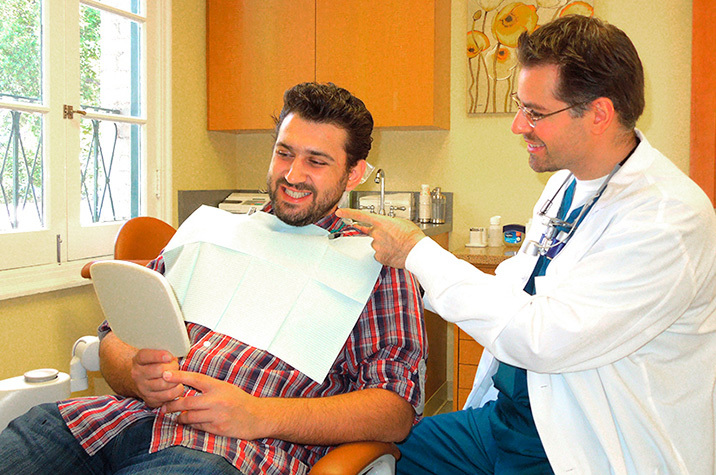 Why Should You Visit Our Family Dentist in Pasadena? Let's face it, seeing the dentist may not be high on your list of fun things to do. Because of this, you may find yourself putting off the care that you need. Why should you visit a family dentist in Pasadena? The simple, straightforward answer is because you want your smile to last you a lifetime. Teeth are not only fixtures that give you a nice looking smile. They are in place so you can chew food on both sides of your mouth. Keeping your teeth clean seems relatively easy. However, because the various types of bacteria that naturally live in the mouth can hide in plaque, and because plaque is difficult to see, there is ample reason to get a little help in the oral care department. How often should you see a family dentist? Children and adults of all ages should see the dentist no less than twice a year. Depending on issues at hand, such as advanced gum disease or diabetes, more frequent exams and cleanings may be necessary. In case you're not picking up on this, the idea is that dental care is tailored to your individual needs. When you see your dentist in Pasadena at Prestige Dental every six months, there is a greater chance that problems you cannot feel or see yet will be caught. This includes early indications of decay, which may present nothing more than slight tooth sensitivity, or sometimes no symptoms at all. When dental problems are detected in early stages, they are more easily managed and sometimes even completely reversed. What happens at your checkups? During every routine checkup, we take a close look at every tooth in the mouth. X-rays imaging allows us to look deeper, at the structures beneath the gums, as well. When we observe your teeth, we can identify "soft" areas of enamel, which indicate the onset of decay. Existing fillings and other restorations are also evaluated to make sure there are no tiny fractures that could be letting bacteria past the protective barrier around the tooth. Gums and other oral tissues also examined for inflammation or signs of oral cancer. The jaw joints, skin around the head and neck, and saliva glands are also checked for any irregularities. After your exam, your teeth will be professionally cleaned and polished. Visit your family dentist in Pasadena Dr. Vasag Bouzoghlanian. Call Prestige Dental at (626) 577-2017 to schedule an appointment with our friendly team! Should a Woman Take Care of Her Teeth Differently During Pregnancy?